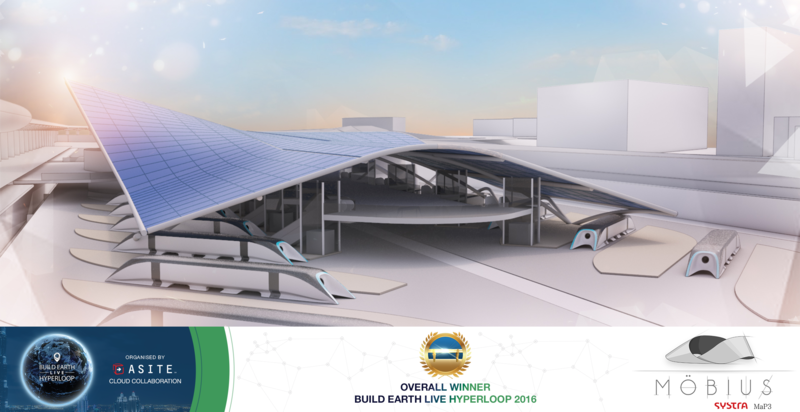 Build Earth Live Hyperloop was the eighth in a series of collaborative BIM competitions created by Asite to raise awareness of cloud-based working and international developments in interoperability. The competition took place September 26th-28th with final presentations hosted by the Dubai Future Foundation in the U.A.E. on Tuesday, October 4th. Mobius was ranked first among the finalists after the panel evaluated the projects from technical and economic perspectives, as well as their ability to reinvent transportation for passengers and cargo alike. The panel also evaluated safety and security, efficiency and sustainability. In the finals stage, the qualifying teams presented their innovative designs before the judging panel; each design had to lay plans for parallel Hyperloop transportation systems – one for passengers, and another for cargo – that would eventually converge into one station at the finish line. Projects also had to include stations complete with spacious halls for passengers to board the trains. A panel of expert judges had chosen 65 teams to compete in the semi-finals at a previous stage. The panel includes specialists from Asite and the world’s largest information technology companies, as well as representatives from local and international government entities taking part in the competition, and representatives of government and private-sector institutions in Dubai and the UAE, the US, and the UK. Tony Ryan, CEO, ASITE, said: "Build Earth Live Hyperloop has exceeded all expectations. With thanks to His Excellency Saif Al Aleeli, backing the 8th Edition of Build Earth live, we received phenomenal international attention and team registrations. In short the response was off the Richter scale. The results speak for themselves I hope you agree". The list of finalists included BIM Unlimited, a team that has participated in a number of Build Earth Live competitions in the UK, Brazil, Japan, the Dominican Republic, and Thailand. The team is made up of a group of innovators – led by Architect Ruben Fernandez – who share a passion to create innovative architecture within a collaborative BIM (building information modeling) workflow. Also among the finalists was Hyperpoland, a team that had previously participated in tech competitions in Poland, Germany, the UAE, the US, and the UK. A group of engineers and architects, Hyperpoland have been working to develop an integrated Hyperloop transportation system. Following the positive feedback they received from the SpaceX competition, the team collaborated with specialists and experts to move the research and development forward. Mobius – a professional team from international French engineering and consulting group Systra – also made it to the finals. Systra specializes in rail and public transport, and Team Mobius has participated in similar competitions in France, the US, and Ukraine. Meanwhile, team BIM Fusion – also a finalist – is made up of construction, design, and academic professionals representing GRAHAM Construction, Ostick + Williams (Architects), Semple McKillop (MEP), and Ulster University in Northern Ireland, UK. The list of finalists also included rLoop, a non-profit, open-source, online think tank. The team is working to “democratize the Hyperloop” by involving the public in their process using the internet. rLoop had previously participated in similar competitions in the UK and Canada. Rounding up the list, Hypernova is a finalist team made up of young engineering students from Cairo University, Egypt, driven by a shared passion for leading innovation through progressive and sustainable work, while the UAE’s Future Architects – a first-time participant and finalist – included a group of students from Ajman University working to create a fully-integrated hyperloop transportation system. Also nominated as one of the most active teams in the competition was Zibsnis from Latvia; BusafiArc from Oman; and Future Architects from the UAE; as well as RB Systems (Russia); Slythunder Crew (UAE and India); Team Khaled; Team SIMENERGO (Ukraine); and last but not least, team Hypernova from Egypt. The Hyperloop Competition attracted attention from regional and international media outlets. The challenge gained a particularly impressive following on Twitter where the dedicated hashtag scored one million views in just 48 hours. What is more, over 130,000 users from around the world interacted with tweets about the event; this reflects the singular attention that Dubai’s edition of the Hyperloop Competition is attracting from all corners of the globe.